Everyone knows the story of Cinderella—that noble endeavor to find the perfect match for a one-of-a-kind glass slipper. Imagine if the story had a different moral: What if we were all expected to make ourselves fit into this one specific shoe? What if shoes only came in one size and we were expected to somehow adapt and get used to it? For many years, many cochlear implants have relied on a one-size-fits all approach. But in terms of relative length, human cochleae have a wider range of variation than human feet. That means you’re more likely to find a one-size-fits-all shoe (or glass slipper) than a one-size-fits-all electrode array. We’ve always offered the widest range of electrode arrays to offer a better match across all cochlea. Now, we’re leading cochlear implants into a whole new era: Individualized CI. Let’s look at how the evolution of our cochlear implant design philosophy has lead us here, and what individualized cochlear implants mean for you and your patients. When our founders invented the first modern cochlear implant, the goal was to provide speech understanding and the ability to communicate. Through this incredible technology, cochlear implant users achieved speech understanding levels that were once considered impossible. Our cochlear implant technology has been able to provide excellent speech understanding. But we wanted to go further—to offer as close to natural hearing as possible. 1. Respecting nature: Every cochlea is a natural wonder—a deaf ear is not a dead ear. There’s a vital network of living nerve structures inside every cochlea, which is why we designed the world’s most flexible & gentle electrode arrays to protect the natural nerve structures. Our FLEX array design enables 100% scala tympani placement for structure preservation and optimal hearing outcomes. 2. Utilizing nature: Your cochlea is naturally organized with a tonotopic frequency response that extends all the way into the apex. To provide a natural pitch match, you need to stimulate the correct location along the whole cochlea. That’s why we use long, flexible electrode arrays to make the most of the natural cochlear potential. And thanks to our flexible design, only MED-EL can offer long arrays (up to 31.5 mm) that are designed to provide complete cochlear coverage. Only long MED-EL arrays can provide a natural pitch-place match in both turns of the cochlea. This is essential for accurate perception of low-to-mid frequencies. 3. Copying nature: In nature, the cochlea uses two kinds of natural sound coding. Place-pitch tonotopic coding is used along the whole frequency range. In addition to place-pitch coding, low-frequency sounds are also coded by rate. With this time-coding, the frequency of nerve signals is synchronized to the frequency of the sound below ~1000 Hz. That’s why we created the only cochlear implant sound coding that mimics the natural time-coding for low frequencies and provides place-pitch match throughout the cochlea.By mimicking natural sound coding, FineHearing provides much more natural sound quality. Only FineHearing’s fine structure processing allows natural pitch perception in the apical region down to ~100 Hz. With this nature-focused philosophy, our cochlear implants can deliver the closest to natural hearing—an experience that no other cochlear implant can match. Providing the closest-to-natural hearing already sets MED-EL cochlear implants apart any other cochlear implant, but we want to deliver the best possible hearing experience for each individual recipient—which brings us to today. From the very beginning, MED-EL has been the driving force of innovation in cochlear implants. Now, we launch a new era in cochlear implants—a new age that offers extraordinary promise for candidates and professionals. By choosing the optimal electrode array for each individual cochlea, you can maximize the natural potential of each individual cochlea. This enables better hearing performance, minimal adaption, and the closest to natural tonotopic mapping from day one. The philosophy of individualization is straightforward: Adapt the implant to your patient, instead of adapting your patient to the implant. The benefit of individualization is clear: Closest to natural hearing in each cochlea from the very beginning—enabling each recipient to experience MyBest™ Hearing. Individualization is unquestionably the future of cochlear implants. For the field of cochlear implants, individualization is a massive leap forward. And for all other cochlear implant manufacturers, it will be a radical shift away from their one-size-fits-all approach. For MED-EL, individualization is the logical next step forward as we continue to lead the way, building on more than 25 years of tireless research & development. And with MED-EL, the future is now. OTOPLAN is the key to making individualized cochlear implants a reality. 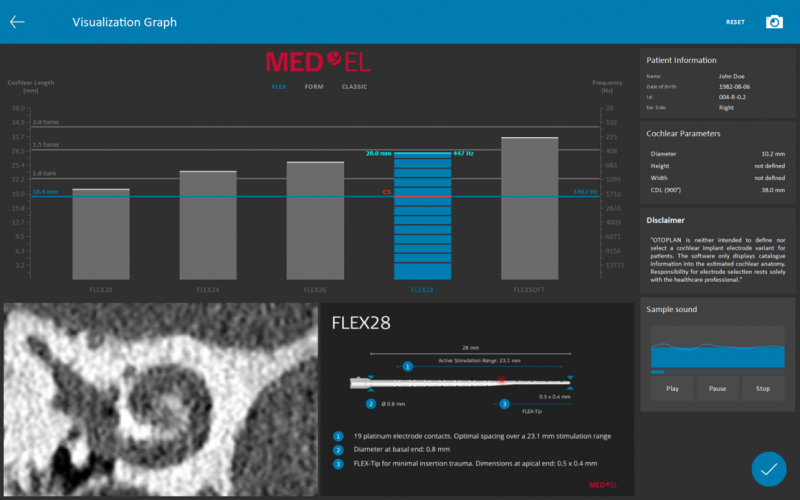 With the intuitive new OTOPLAN software platform, you can quickly and easily visualize each individual patient’s cochlear anatomy like never before. This revolutionary tablet-based planning software lets you measure the dimensions of each patient’s cochlea in a just a few quick steps. The electrode visualization tool lets you instantly compare insertion depth & tonotopic frequency match of each MED-EL electrode in every individual cochlea. With our comprehensive electrode portfolio, you can easily select the ideal electrode for each individual cochlea. Our FLEX electrode arrays are available in lengths from 20–31.5 mm to provide the best possible fit for each cochlea. OTOPLAN also lets you easily analyze post-operative imaging and confirm the location of each individual electrode contact. This is key to our upcoming anatomy-based 3D fitting concept; this will enable you to adapt the frequency allocation map to best match the natural tonotopic map of each individual cochlea. 3D fitting will let audiologists easily combine subjective responses, objective measures, and patient-specific anatomical data to create a fitting map that is the closest to natural tonotopic match from the very beginning. Our philosophy of individualized CI & MyBest™ Hearing will continue to grow & evolve, but we can say with certainty that the future of cochlear implants has arrived. By combining our comprehensive electrode portfolio with OTOPLAN and individualized implantation, we have now launched a whole new era in cochlear implants. Ready to learn more about the future of cochlear implants? Don’t miss Prof. Paul Van de Heyning’s firsthand experience with OTOPLAN and individualization. We’ll be sharing many more articles, including an in-depth look at our expanded electrode portfolio and the future of anatomy-based 3D fitting. Make sure you get all the latest updates on individualization and more from MED-EL—subscribe now! 1. Schatzer, R., Vermeire, K., Visser, D., Krenmayr, A., Kals, M., Voormolen, M., Van de Heyning, P., & Zierhofer, C. (2014) Electric-acoustic pitch comparisons in single-sided-deaf cochlear implant users: frequency-place functions and rate pitch. Hear Res., 309, 26–35. 2. Rader, T., Döge, J., Adel, Y., Weissgerber, T., & Baumann, U. (2016). Place dependent stimulation rates improve pitch perception in cochlear implantees with single-sided deafness. Hear Res., 339, 94–103. 3. Landsberger, D.M., Vermeire, K., Claes, A., Van Rompaey, V., & Van de Heyning, P. (2016). Qualities of single electrode stimulation as a function of rate and place of stimulation with a cochlear implant. Ear Hear., 37(3), 149–159. 4. Prentiss, S., Staecker, H., & Wolford, B. (2014). Ipsilateral acoustic electric pitch matching: a case study of cochlear implantation in an up-sloping hearing loss with preserved hearing across multiple frequencies. Cochlear Implants Int., 15(3), 161–165. 5. Harris, R.L., Gibson, W.P. Johnson, M., Brew, J., Bray, M., & Psarros, C. (2011) Intra-individual assessment of speech and music perception in cochlear implant users with contralateral Cochlear and MED-EL systems. Acta Otolaryngol., 131(12), 1270–1278. 6. Müller, J., Brill, S., Hagen, R., Moeltner, A., Brockmeier, S.J., Stark, T., Helbig, S., Maurer, J., Zahnert, T., Zierhofer, C., Nopp, P., & Anderson, I. (2012). Clinical trial results with the MED-EL fine structure processing coding strategy in experienced cochlear implant users. ORL J Otorhinolaryngol Relat Spec., 74(4), 185–198. 7. Roy, A.T., Carver, C., Jiradejvong, P., & Limb, C.J. (2015). Musical sound quality in cochlear implant users: A comparison in bass frequency perception between Fine Structure Processing and High-Definition Continuous Interleaved Sampling Strategies. Ear Hear., 36(5), 582–590. 8. Roy, A.T., Penninger, R.T., Pearl, M.S., Wuerfel, W., Jiradejvong, P., Carver, C., Buechner, A., & Limb, C.J. (2016). Deeper cochlear implant electrode insertion angle improves detection of musical sound quality deterioration related to bass frequency removal. Otol Neurotol., 37(2), 146–151. 9. Buchman, C.A., Dillon, M.T., King, E.R., Adunka, M.C., Adunka, O.F., & Pillsbury, H.C. (2014). Influence of cochlear implant insertion depth on performance: a prospective randomized trial. Otol Neurotol., 35(10), 1773–1779. 10 .Kleine Punte, A., De Bodt, M., & Van de Heyning, P. (2014). Long-term improvement of speech perception with the Fine Structure Processing coding strategy in cochlear implants. ORL, 76, 36–43.